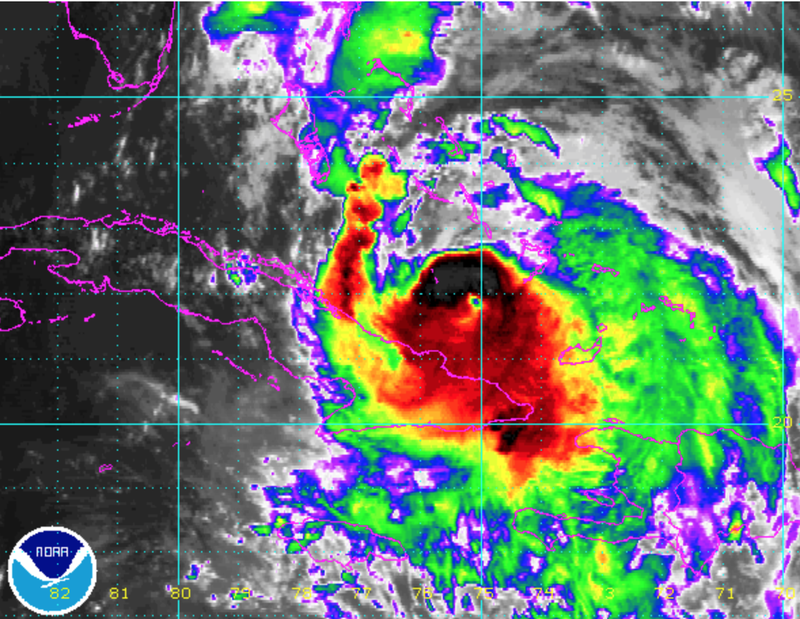 Matthew is beginning to regain strength after its encounters with the high terrain of Cuba and Hispaniola. The eye has become much better defined the last two hours as depicted on the satellite. 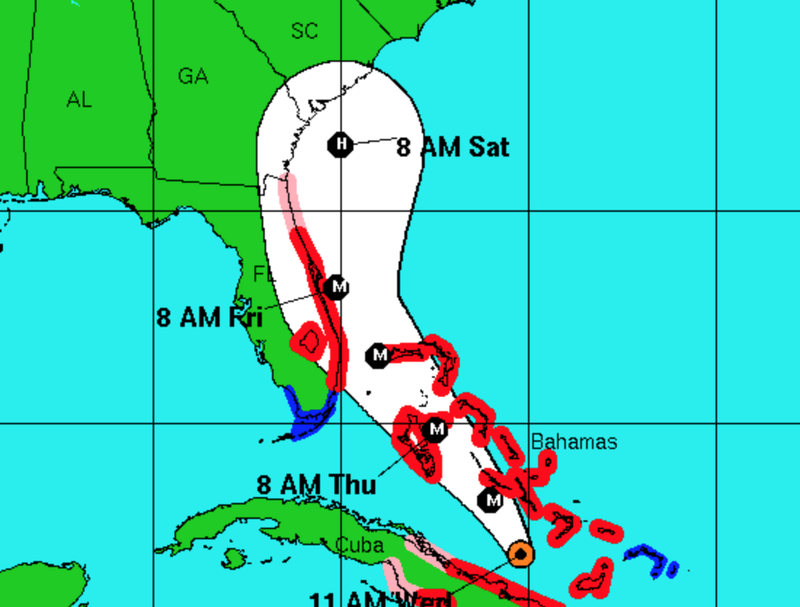 Hurricane warnings (red) are now in effect from near Miami to near St. Augustine. 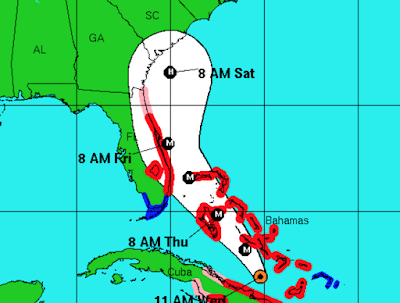 I agree with the "M" (major hurricane) forecast of the storm coming ashore or skimming the east coast of Florida. I also agree, for now, with the 8am Saturday forecast. We'll deal with what may occur after that time in this afternoon's update. Also, in this afternoon's update, I'll have some wind speed forecasts to pass along. Vote, if you have made up your mind. If the stronger models are correct, --while unlikely -- it is possible power could still be out in some places on election day. Regardless, that is one less thing you will need to do. If you don't have a generator, get a power inverter or two. Radio Shack and similar stores sell them. They are a "poor man's generator" and will keep your cell phone, laptop, and similar charged. If you live in a 100-year flood plain (you can check at city hall or your library) or on the coast figure out your evacuation strategy now. Make your list of things you will take with you. Follow governmental suggestions. Purchase extra staples. Without power, stores will be closed. Purchase booster batteries for your cell phone and other essential equipment. If you need insulin or other medicine that must be kept chilled make plans now. If you live in wooded area (parts of the First Coast), does someone in your vicinity have a gasoline-powered chain saw? Does it have fuel and a reasonably good chain/blade? Test it, now. I urge you to follow these suggestions as they are low cost. The electric utilities are already mobilizing as are the insurance companies to handle the situation once it is safe to do so. That said, there could be some localized areas without power for a week or two. If you live in one of those areas you will find these suggestions will save you a lot of grief. Good luck. Another update late this afternoon.